They live on the news, in photographs, in tragic love stories. But are they real? Why is it that the ultimate word of the deceased is elevated on a pedestal for all of us to marvel and mourn? For a person such as myself who is yet to lose a family member or close friend the dead seem very distant. I recently realized that those pushing daisies were once just as human and just as alive as I am now. This subtle epiphany presented itself to me as I tasted and then devoured the collection of short stories and essays by the late Marina Keegan, killed at age 22. 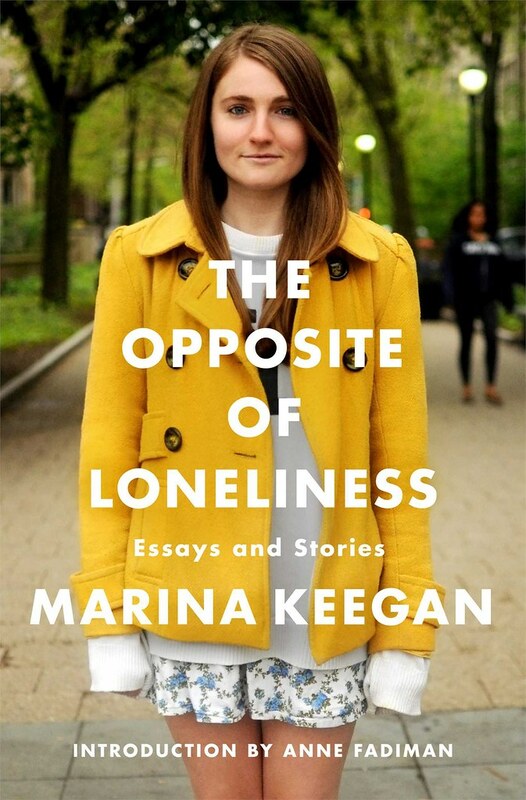 Titled "The Opposite of Loneliness"after her viral essay published on the Yale Daily News right before her graduation, this bundle of youth is definitely the most inspiring piece of writing I have read in a long, long while. I was gifted this book for graduation by a lovely lady who handed it to me with giggles in her eyes. She told me it was an ode for youth, but I should beware: "the author died shortly after writing the title essay." I was thankful, excited and then confused. Nevertheless, I grabbed the opus a few days later. After finishing the first short story in bed one night with hot tears all over my cheeks, I was hooked. Never have I felt such a connection between a piece of literature and my own feelings and experiences. I have read about the industrial revolution, post-colonialist islands, and Berlin in the eighties. I have never read of the frustrations we teenagers handle with by flipping through the hundreds of Facebook pictures our love interest has posted through the years. This girl from New England, a Yalie, told tales of being young and being alive. Her style is beautiful English, but it sounds like a 22 year old. The characters and places of her tales are vivid, and her message is raw. Adolescent loves, safe places, thoughts of family, our spots in the world, and of how strange living really is. I was so dumbfounded with this book because while I was reading, I hardly accknowledged that it was published posthumously by a brilliant young (so young) writer that will never amaze the world with more of her writing. You see, I never knew Marina Keegan. She was never alive for me. Now suddenly I have to mourn her? Not only a marvelous piece of writing, but a beacon of light for people like us. Young people who need someone to identify with. It was a pulse of inspiration to live my life to the fullest, a pulse of inspiration to write something of my own. I don't believe her tragic death is what we should take away from this collection. What struck me was that here is a girl at the top of her game, graduated from the Yale writing program, a job lined up at the New Yorker, with a million opportunities ahead of her. Isn't it beautiful that this is the way she will be forever? Always hopeful and young, so young.